Summary: Nell knows a secret about her perfect, beautiful sister Layla. If she tells, it could blow their world apart. When Nell and Layla were little, Nell used to call them Nellayla. Because to Nell, there was no difference between where she started and her adored big sister ended. They're a unit; divorce made them rely on each other early on, so when one pulls away, what is the other to do? But now, Nell's a freshman in high school and Layla is changing, secretive. And then Nell discovers why. Layla is involved with one of their teachers. And even though Nell tries to support Layla, to understand that she's happy and in love, Nell struggles with her true feelings: it's wrong, and she must do something about it. 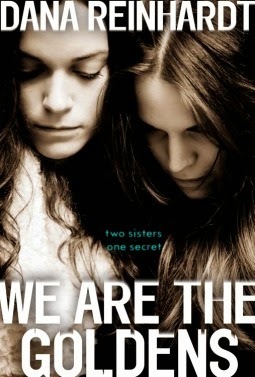 Review: There are a lot of mixed feelings going on over here about We Are the Goldens. This was the first time that I've read anything by Dana Reinhardt. I was looking for a short, quick read and this definitely delivered that. It’s the story of Nell who is the younger of two girls and is told in the second person which was a bit different for me. The story is told from Nell's point of view to Layla. Nell is a freshman in high school and has always been in her sister, Layla’s shadow. She’s always followed her around and loved being around her-- looking up to her as most little sisters do. A lot of things change during Nell’s freshman year, primarily her sister Layla. She begins to put more distance between herself and Nell and because of this Nell has to learn how to identify who she actually is. Layla is involved with one of their high school teachers and Nell tries to be supportive and tried to understand. But is it okay? Is love all that matters? The voice that this short novel is told in is great. It kept me flipping the pages quickly—I especially loved Felix, Nell’s best friend. He was, hands down, my favorite part of this book. He was sweet, a little nerdy, and absolutely hilarious. There were several characters in this book that just lacked for me… they weren't poorly written just so unlikable so I don’t judge the book based on that. I know that not every character in a given book can be likable, but I seriously wanted to slap Layla and tell her to stop being such a little brat all of the time. Although the synopsis of the book primarily focuses on the relationship that Layla is in with their teacher there are a few underlying story lines that I enjoyed more than Layla's dilemma. Although I purposely looked for a shorter read, I almost wish that this was a bit longer. I just felt like I wanted more. Was it a good book? Absolutely. Was it my favorite book of the year? No. But I did enjoy her writing style and would read more books from her in the future.